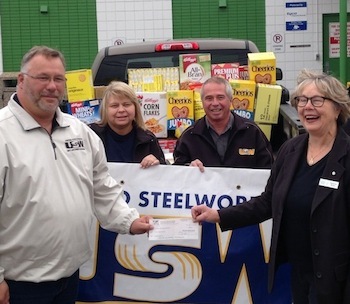 On Friday, the United Steelworkers Union presented Edmonton’s Food Bank with a substantial monetary gift from the United Steelworkers Humanity Fund as well as food donations. Jeff Kallichuk, United Steelworkers staff representative for Northern Alberta and the Northwest Territories, acknowledged the food bank for its response to the Fort McMurray fire. September 27, 2016. On Friday, the United Steelworkers Union presented Edmonton’s Food Bank with a substantial monetary gift from the United Steelworkers Humanity Fund as well as food donations. Jeff Kallichuk, United Steelworkers staff representative for Northern Alberta and the Northwest Territories, acknowledged the food bank for its response to the Fort McMurray fire. “We need to ensure that local charities are able to continue their work after they help during situations like the fires. Our donation of food and funds are to help with the year-round work they are doing. Their doors don’t close after a disaster, they need to keep going and we are here to help,” said Kallichuk. Edmonton’s Food Bank provided services to Fort McMurray evacuees and the other organizations and communities serving evacuees beginning May 4, 2016. In the weeks that followed, the food bank supplied food, both directly and indirectly, to thousands of evacuees. Many evacuees were not able to return to Fort McMurray and remained in Edmonton.